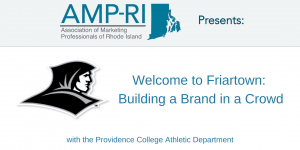 Our guest speakers, Ashlee Magosin, Associate Athletic Director for Business & Brian Catinella, Assistant Athletic Director for Marketing & Promotions, will discuss the opportunities and challenges of branding, marketing, licensing and promotion of the two Providence College Friar and Skating Friar brands. Learn about the history and struggles of managing a growing brand, as well as items to think about when creating marketing plans, licensing goals and promotions in general. If you are interested in branding, re-branding, and/or growing a brand locally, regionally, or nationally – this event is for you! Our guest speakers will be giving away a Friars Head magnet for every attendee, as well as extra special give-aways throughout the night! You won’t want to miss this educational, networking opportunity! Ashlee Magosin is a 2005 graduate of Penn State University and 2007 graduate of Wagner College where she earned her MBA. With a passion for sports and education in Sports Journalism and Business, Ashlee started her career as Administrative and Marketing Assistant for Wagner College Athletics and went on to be promoted into business roles in Athletics at Duke University and University of Maryland-College Park. She has served as the Associate Athletic Director of Business at Providence College since December 2014 and oversees all aspects of business operations and financial planning related to Athletic Administration, Sports and Spirit Teams. Ashlee took over athletics licensing initiatives two years ago with the goal of expanding the Friar brand and retail opportunities, both regionally and nationally. Brian Catinella is a 2013 graduate of Providence College. He went on to be a graduate assistant in the Athletic Marketing & Promotions department until 2015, when he graduated with his MBA. Brian has worked at Providence College full-time for the past 3 years and currently serves as the Assistant Athletic Director for Marketing & Promotions at Providence College. He oversees Athletic Marketing which includes advertising and promotions for 19 varsity sports, branding of the Athletic department overall and assisting with the college’s licensing initiatives. Parking is Free and Light Appetizers Will Be Served! Parking is available in the lot across the street from R&W or along Cromwell Street. Please use the main entrance along the side of the building (signs will be posted). If you pay at least 24-hours in advanced, no. We will keep a record of those who purchased a ticket at the door and confirm your payment then. Sure! We meet for about two hours, but follow a typical flow: between 5:30 – 6:10 people arrive, grab some appetizers, and network with others; from here, our guest speaker will present and take questions until about 7:15pm. At this point of the night, our program is complete, but you are welcome to stay and chat longer, or spend time at the restaurant or bar as much of the crowd will do.